The Historic city of Toledo is one of the most popular day-trip destinations from Madrid. With a history spanning over two millennia, it is one of the most ancient cities of the world and was declared by UNESCO as a world heritage site in 1986. 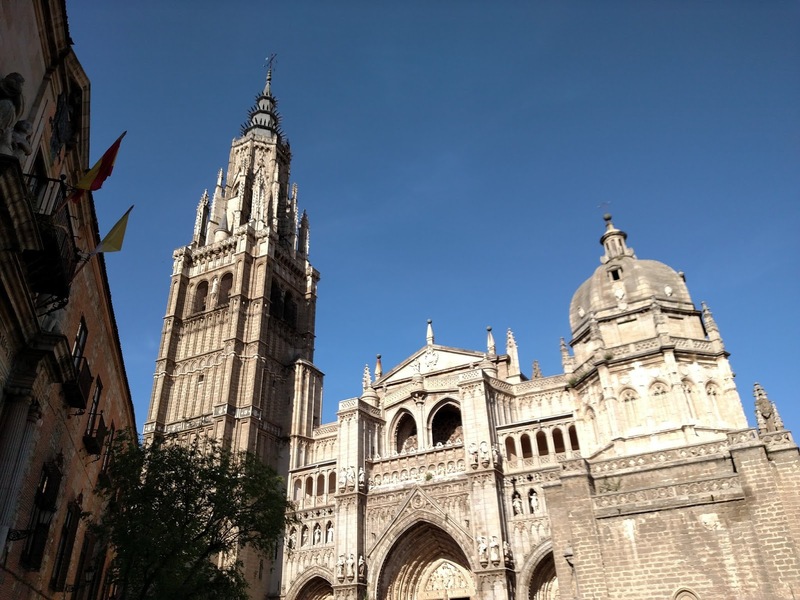 This article gives you all the details you need to take a Madrid to Toledo day trip, and the things to do and see in the historic city. It is also my humble attempt to recreate the memories and give you an honest review of our free walking tour of Toledo. Things to do in Toledo in One day or Two! I loved how organized the transport to nearby regions are from Madrid. There are high-speed trains every hour which go directly to Toledo in 30 minutes, frequent public buses which usually take an hour and there are these private tour buses which organize day trips to Toledo. Being first-time tourists to Europe we decided to take the tourist bus which includes a free walking tour of Toledo and panoramic views. It costs five euros more than the train but is completely worth it. Our guide, Rachel was very friendly and shared the city’s history and folklore. We bought the tickets at one of the many counters at Plaza de Espana in Madrid but you can pre-book it online as well. As soon as we disembarked the bus we were thrilled at the sight of the old buildings clamped atop the hill and ruins of the great wall that once surrounded the city. However, most of the ancient walls are still intact. The fortified city is at an elevation 614 ft where you can reach in no time thanks to the series of escalators raised along the ancient walls of the city. The ambiance is heightened by live music played by amazingly talented artists as you rise through the walls and enter the city. Even for a non-shopper like me, the market with some of its unique Toledian offerings has its own allure. Damascene jewelry, ornamented swords and knives, and special almond-based desserts called Marzipan – these are a traveler’s delight. We walked through the throbbing market area which was all decked up for some festival until we entered the narrow stone pavements. The narrow cobbled-streets with stone walls on both sides almost transported us to a different era. Being a big-time Game of Thrones fan, I could totally see myself walking into the King’s Landing of Westeros. 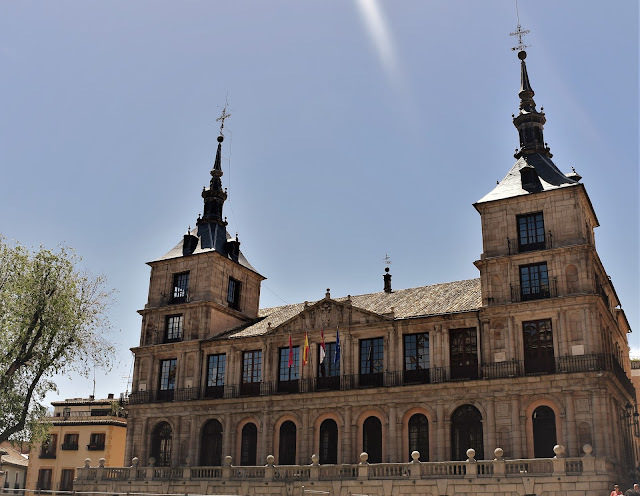 Toledo is known as the city of three cultures as for centuries during medieval period it was home to people of three different religions – the Jews, the Christians and the Muslims who co-inhabited in the same place in harmony. Well, harmony, unfortunately, is not a permanent state in a world full of conflict – there were wars, there were forced conversions, expulsion, and even extermination. In the 15th century, the Roman Catholics put an end to the co-existence of several faiths by enforcing Christian faith and expelling Jews from the land. Also called, Catedral Primada or the Primate Cathedral of Saint Mary is a twelfth-century masterpiece of French Gothic architecture. It was built for 266 years. The north tower of the cathedral hosts the famous “Fat Bell”, which is one of the largest bells in the world but is never rung. There is much folklore about what happened when the bell was the first rung- some say that all the windows of the buildings across the city collapsed, while some even say that all pregnant women who came to see the ceremony had pre-mature delivery at the instant! The other section of the facade is the Baroque dome of the Mozarabic chapel. It stands in place of the second tower that was planned but not built due to shifting ground. The main entrance is named portal of the lions after the lion sculptures adorning it. Unfortunately, we could not enter the temple as we ran short of time, and I seriously regret this. A monument built for over two and a half centuries should never be missed. The building facing the cathedral is the Town hall of Toledo, which houses the members of the city council. Its construction is said to have begun in the late 16th century and it was completed in 1703. Facing the cathedral on the other side is the Archbishop’s palace built in the 13th century, but despite its historical significance is easily overshadowed by the Gothic Cathedral. Basically, this is a golden triangle of three of the most iconic monuments of Toledo. Our next stop was the Jewish quarter- a neighborhood of Jewish people in the medieval ages. Characterized by extremely narrow cobbled streets and medieval styled buildings, this place has a very romantic ambiance in general. The most famous monument here is Santa Maria la Blanca, which is a former synagogue – a Jewish place of worship. Our guided walking tour ended at the first panoramic viewpoint near the site of Plaza de Salvador. From here we could see some of the most famous places of Toledo including the Monastery and the Museum of El Greco, the most celebrated artist of Toledo. This is where we took a lunch break after which would have some free time to explore the city. The buffet spread for lunch included the Spanish special, Paella with prawns, roasted chicken, salad, pasta, and soup. Our first stop after lunch was the famous Monastery of San Juan De Los Reyes. The beautiful Gothic style monument was commissioned by “Catholic monarchs”, Queen Isabella and her husband King Ferdinand II to commemorate the birth of their son and their victory in the Battle of Toro against Portugal in the 15th century. The main facade building is adorned with exquisite sculptures of chained saints which represent the Christians who were imprisoned by the Moors. On the other side is the church facing the river Tagus. We walked into the monastery and walked up the stairs to the church and then walked down to the garden beneath until we could finally see the river. Walking on this historical bridge was my best experience in Toledo, I would put it in the city tourism’s top things to do list. Walking on the beautiful ancient bridges across the Tajo river is the best thing to do in Toledo. I loved that the bridges were not crowded as I expected them to be. Tagus or Tajo is the longest river in the Iberian peninsula and has been the lifeline of Toledo for ages. The beautiful medieval bridges across built across the river take you to a different world. We walked on the bridge closest to the monastery, the San Martin bridge, which was constructed in the 14th century. The bridge has 5 arches the largest one at the center spanning 40m and is fortified on both sides with towers. The most famous bridge in Toledo is the Puente de Alcantara, which was first built in the Roman era. For those looking for some adventure, there are zip-lining activities conducted near the river. On our way back to the bus stop we walked around the street soaking in the spirit of this historical city. There are innumerable sword shops showcasing the Toledian steel. These are a special type lightweight but sturdy steel which was in high demand across the western world during the medieval ages. Iconic Hollywood movies like Gladiator and popular series Game of Thrones used swords made in Toledo. 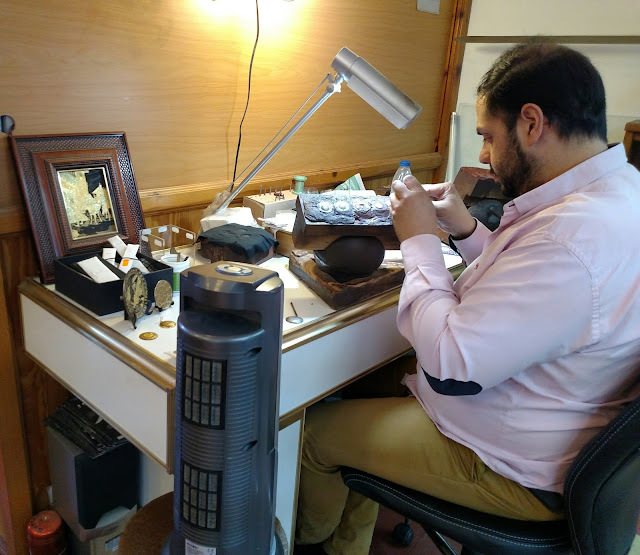 We entered a shop where an artisan was making Damascene jewelry and demonstrated the procedure to us. It’s amazing to see such skilled people at work- putting the fine gold threads on iron and hammering it on the intricate design without any visual aid. We spent some time at the garden near the escalators before we descended down the enchanting walls of the city to the bus stop. As we set off on the double-decker tourist bus to return, we thought that our trip was over for the day. But the bus drove uphill and took us to several panoramic viewpoints of the city – the most famous one being Mirador del Valle. You can see all the famous monuments of the city on the other side of the river, including the Alcazar of Toledo. Enter the Toledo Cathedral. 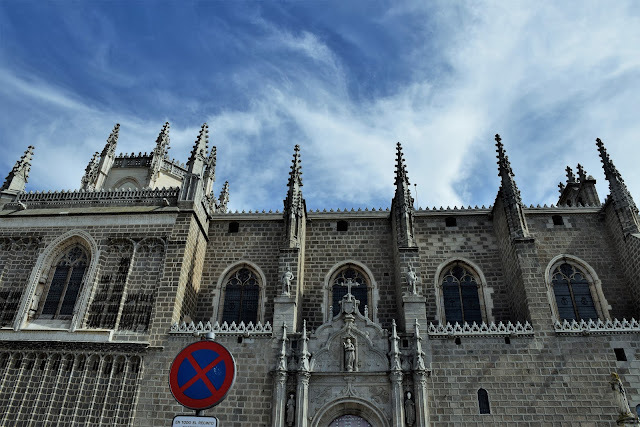 Although the entry fee is cheap, it takes time to explore a grand historic monument like the Toledo Cathedral or the monastery. We wanted to get a holistic view of the city in those few hours we spent there, so skipped entering any of those. Pin now and read again when you want to! All pictures unless otherwise mentioned are owned by Backpack & Explore and copyright protected. I can see why this town is such a popular day trip. The architecture is absolutely stunning! And I am really partial to towns along rivers. This place really just looks so perfect. Toledo sounds like a city that knows how to make an impact on a visitor. I live the folklore behind the fat bell and could definitely get down with some marzipan. I will be in Spain in October. I have never heard of this place but now I’m sure going to try to add it to our itinerary. Great information. It sounds like a wonderful place. You did a great job of making us feel like we took the tour along with you. Thanks for taking the extra time to share all of the details and the great photography! I have a friend who loves to travel to Spain, but she has never mentioned this place. I"ll let her know about your article. So happy to know that you liked those details. Thank you so much for your time, part of me used to think the details might be boring to many. It seems like such an interesting, historical place to visit. I love that there is so many transportation options to get there! Thanks for taking me along on your trip to Toledo. Fascinating history and interesting to learn about the different cultures that co-existed together. Having a local guide always helps to understand the local culture better. Stunning architecture and great photography. The architecture is seriously stunning, so is that viewpoint! I didnt realize it was so easily accessible from Madrid! Did I just take a tour? lol You did a great job making your readers feel included in your journey. The beauty and history seem like a must see! Great job! The cherry on the top for Toledo would definitely have to be the view from Mirador del Valle! Such an amazing perspective of the town! I especially like the look of The Toledo Cathedral! Wow this looks so beautiful! I haven't made it to Spain yet unfortunately, but my list keeps growing seeing all these amazing places in Spain! I like Historic Tour like your day trip to Toledo. Sounds like you were lucky to have a guide like Rachel. I wish to have an opportunity to visit Toledo one day. For now, probably I will visit Toledo in Ohio, USA. I have't been to Spain yet, but Toledo reminds me of a lot of the medieval villages I visited in Tuscany! It looks so beautiful and fascinating. Whenever I get to Madrid, I'll definitely check out Toledo too! I love Spain! I've never been to this specific place but it looks lovely! Spanish food is one of my favourite and the people are nice. This tour of history of Toledo is just amazing. Architecture of ancient sites are as beautiful as ever. Toledo looks beautiful! I've never been to Spain but I hope I can soon. Toledo will be on my list for when I get there! My kids were floored by the size of the cathedral. I love Toledo and getting lost in it's small streets. All signs point back tot he Cathedral. 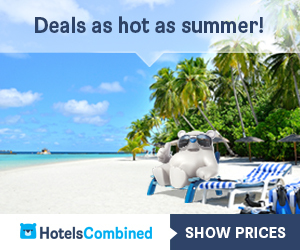 You day sounds like it was well spent and love the double decker bus bonus of great vistas! Toledo looks like a great place to visit with family. The cathedral looks huge and beautiful. I have to add Toledo to my list now. This tour of history of Toledo is just amazing. I absolutely loved the architecture and have to visit one day. What a picturesque place. We're yet to visit Madrid but we're hoping to very soon. Will have to make sure we allow enough time that we can take a trip out to Toledo! We love exploring historical places so I think we'd have a great time here. Any place with a great sunset is a delight to visit! Looking forward to planning a trip here. I love places which have rich history, and Toledo never come short of it. Hopefully I got a chance to visit this place one day. I have heard of the various Day trips one can take when in Spain. While planning an itinerary for a friend I was in a dilemma as to which one to suggest. I am glad I came across this website. I know how for sure Toledo should be experienced. I came from a country which was shaped mostly by Spanish culture so I can see a lot of semblance with our churches. I love places with rich history and beautiful architecture. Surely worth traveling. I've never been to Toledo but it sounds like a great day trip from Madrid. I love these old centres with a rich history. There is also a lot of monuments to the Christian monarchs in other Spanish cities. Seemed they really made their mark! Thanks for virtually touring us around Toledo. I know that I will enjoy visiting this place because I love walking tours and take my time admiring its beauty. Where will be your next trip and what destination? I am going to Spain next year and Toledo is on my list! Good to know that there are fast trains from Madrid that take about 30 min, that’s really cool! The Toledo cathedral and Jewish Quarter look like the perfect places to explore on foot. Historical towns like this one are amazing to explore, that’s what I am looking forward to the most in Spain. Oh, and, the food, of course! I’ve been to Spain many time but have never visited this place. It seems to be very cultural and steeped in history. You must have walked miles during your tour so I’m sure the Paella lunch was welcomed. I love paella, I always like to have a traditional dish like that when visiting a foreign country. It looks Toledo was an amazing experience! I would love to visit Toledo one day (hopefully soon!). There is so much history there, and it has always fascinated me. The Cathedral and monastery both look especially beautiful, and I think those would be at the top of my list. 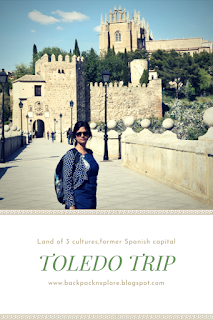 I learned a lot about the history of Toledo but never got the chance to visit. I absolutely love the architecture and I absolutely must visit one day. Those sunsets make Toledo even more appealing. I’m glad I came across this article. Toledo has so many historic places. I really enjoy doing walking tours while exploring the history and culture of the city. It was interesting reading about the Fat Bell at the Toledo Cathedral. Also the ancient bridge with that scenic backdrop looks great. Would love to visit Toledo on my next visit to Spain. I’ve heard so much about Toledo and it’s beautiful panorama views! Your pictures definitely did them justice. I love that included a free walking tour in your itinerary because I think they are the best way to get a quick overview of a city. I like to pair that with my own wanderings for a quirkier look at the destination. I honestly think walking tours are underrated. I feel as if you soaked up a lot of knowledge because of the walking too! The history you retold was really fascinating. I think I’d be most excited to visit the Jewish quarter! I had never heard about this place called Toledo but its definitely on my cards now whenever I am around Madrid. Walking and exploring on foot is my favorite way of exploring a new place. I would love to dive in the beauty and heritage of this UNESCO world heritage site. Damascene jewelry, Fat bell, Cathedral, monastery have got my eye. We enjoyed our free hours spent in Toledo when we visited on a road trip. We love walking tours and actually should have thought about taking one. Great idea getting the Tour Bus from Madrid, a great tip. What a great day trip from Madrid and it wasn’t far at all. Grea tip about making a small extra to go on the bus but also getting a free walking tour. When we are short on time, we find that the tours are the best way to get to know a destinaiton. I would have loved the market with all is wonderful fares (I’m a shopper!) and I can imagine how GOT it could look. The jewellery making sounded so interesting and the views are gorgoeus. What a great place! I hadn’t thought about visiting Toledo before but it looks really interesting. I love exploring medieval towns and this is a great guide to explore the city on foot! Thanks for sharing! Such a beautiful place! Like yourself, I love a little history throwback when visiting a new town. And it is beautiful to hear about different religions and people living together harmoniously at one point in time here. Will definitely be adding this to my to-do list when I head to Europe next! Wow! 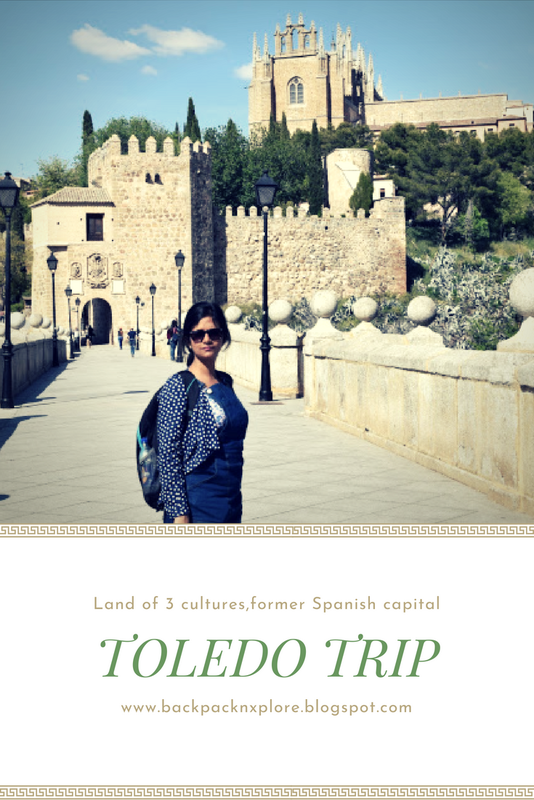 I did not realize that there is so much to see in Toledo and I would love to join the walking tour if given a chance. This place is so rich in culture and history plus the structures are worth seeing up close. Thank you for sharing your photos. I enjoyed them. Toledo looks lovely, I would prefer to stay here than in Madrid. Love the old architecture and medieval bridges. And despite not being religious, I love exploring old cathedrals and churches. Toledo seems to have emerged straight from the pages of a classic from the medieval times. The buildings look so lovely, especially the Bridge. In fact, can imagine a knight in shining armour to emerge any moment from there! As a day trip, Toledo seems to make for a thrilling adventure. What a great day trip to Toledo and how great that Rachel was such an amazing guide. I like tours that combine some structure with free exploring time too. I bet the paella was amazing. And what a bonus to see all those panoramic views at the end as well! Toledo is really pretty town. I really wanted to go there when I was in Spain but somehow we did not get much time from Madrid. The views of the town I’ve been taking. I am sure the cathedral must be really beautiful and also the Salvador square. 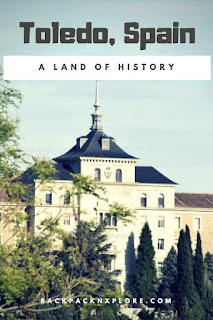 This is a highly recommended day tour from Madrid.